Store it!... Display it!...Sell it!.. As more wine makers introduce new labels it is important as a merchandiser to store and sell product in an organized manner. 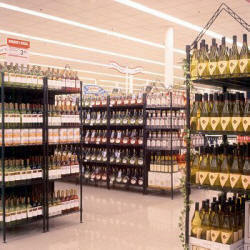 Unique wine storage and display solutions that promote organized merchandising. Wire crates highly visible display. Wire forms a cradle that nests individual bottles. Shelves spread 5" (127mm) apart for easy access. Open wire permits free air circulation around bottles. Store large quantities in limited space-average one case per linear foot of shelf. Keep corks moist-inserts hold bottle at 10 degrees slant. Open wire design allows air flow for proper temperature maintenance. Units enclosed to secure product. Optional locking door available for the 16-case unit! Large 15" space between shelves.